My favorite part of being the SpokesDog were the treats I received. 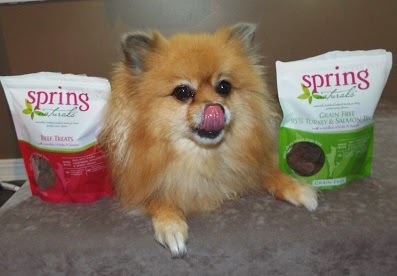 I enjoyed 2 bags of delicious made in the USA Spring Naturals Treats. Spring Naturals treats don't contain any: wheat, gluten, corn, soy, by-products, artificial preservatives, artificial flavors, or artificial colors. Spring Naturals treats have real meat, not meat meals. The first treats I tasted were the Grain Free 95% Turkey & Salmon Treats with a medley of fruits & berries. They are yummy! Baron likes them too, and he is the pickiest dog in our furmily. He usually won't eat fish dog treats, but he eats these. Ingredients: Turkey, salmon, apples, natural flavor, salt, cane molasses, chickpeas, spinach, blueberries, cranberries, flaxseed, rosemary extract, apricots, dandelion greens, zinc propionate. Next I tasted the Beef Treats with a medley of fruits & berries. They are delicious too! I get a whole treat for a snack, but Mom tears pieces off when she uses them as rewards. These treats are yummy chewy meat treats. Ingredients: Beef, apples, natural flavor, salt, cane molasses, chickpeas, spinach, blueberries, cranberries, flaxseed, rosemary extract, apricots, dandelion greens, zinc propionate. 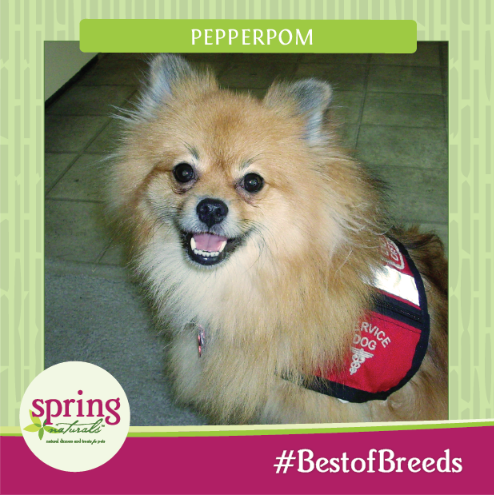 Get your paws ready, one lucky Pepper's Paws reader will win a bag of Spring Naturals treats. Login to the Rafflecopter for entry options. Giveaway Disclosure: I did not receive any compensation for this giveaway. Spring Naturals will ship the prize directly to the winner of the giveaway. I am not responsible for lost or missing prizes. The opinions in this giveaway are my own and not influenced by any outsider. You must leave a comment on this blog post for your entries to be valid. I think he'd like the beef. The beef flavor would probably be my 2 dogs favorite! I like the sound of the turkey salmon treats. Ooooo, you always review the bestest stuffs Pepper!! I thinks the beef are the tastiest! Oh, BTW, you are lookin' FABulous gurl!! I loves your Service Dog harness! Well, my dogs haven't tried these yet, but I think they'd like the Turkey & Salmon flavor. I think the Beef Treats with a medley of fruits & berries would be a hit. turkey and salmon would be a big hit I bet!